Virtually everything in the world with moving parts eventually starts making a mysterious and troubling sound. Cars tend to be the worst culprits for this, but around the house HVAC equipment often runs a close second. And like cars, air conditioners have a number of moving parts, which means an air conditioner rattling sound can come from a number of different sources. Here we'll discuss some of the most common symptoms. But, please, don't go digging around inside your AC equipment unless you know what you're doing. Just to give you one example, condenser units have high-voltage capacitors that can give you a nasty shock even when the power is shut off; call an HVAC pro instead. A standard central AC system is made up of three main "parts": the outdoor compressor/condenser unit, the indoor air handler (typically a furnace), and the network of air ducts (the same ones used by the furnace in winter). A weird air conditioner noise could come from within any of these three systems. Fortunately, the systems are far more distinct and easier to identify than anything under the hood of a modern car (which these days is slightly less approachable than the Batmobile). However, because the main sections are interconnected, it's possible for noises to telegraph from one part to another, much like a toy phone made with two soup cans and a string. The outdoor unit of a central AC system is typically called a condenser, while the essential equipment inside is the compressor. The compressor has a big motor that, as you know, makes a lot of noise under normal conditions and also creates a lot of vibration. The vibration can lead to loose hardware, possibly in the compressor's mounts or elsewhere. This certainly could be why your air conditioner is making noise, especially if it sounds like rattling metal. There's a lot of vibration when the compressor starts up, and rattling which occurs only during startup is a pretty good clue that hardware is the culprit. The primary moving part on an air handler is the blower assembly, a big motor with a fan. The motor or fan wheel can cause a rattling sound when your air conditioner is actively blowing air through the system. This isn't necessarily a common symptom, but it's possible. The air handler might also pick up a rattling sound from the outdoor condenser unit. If you hear the sound inside the house (near the air handler), go outside and listen to the condenser; if the sound is louder outside, you know it's not the air handler. You can try another trick with some (typically newer) systems: wait for the compressor to turn off at the end of a cycle, then listen to the air handler while it completes its cycle (this time delay doesn't occur with all systems or in all climates). If the blower is quiet while still running, it's off the suspect list. Not to dash your hopes here, but ductwork is less likely to rattle than it is to rumble, boom or pop (caused by the thin duct metal expanding and contracting with changes in temperature or air pressure) or to whistle from the air itself. That said, airflow can create a rattling sound at vent register or grill or even at a duct joint. If you think an air conditioner rattling sound is coming from the ductwork but you can't pinpoint the source, there's a good chance the rattle is being transmitted through the ducting from elsewhere in the system. Time to take another look at the air handler and condenser. Small air conditioners, such as window and through-the-wall models, have the compressor and air handler systems in one unit, and no ductwork (unless you've tried to MacGyver something here). It's common for compressors and fan motors on small units to become noisy over time as lubrication deteriorates and motor bearings wear out. Internal parts typically are sealed and therefore not fixable, but it may be cost-effective to replace a worn fan motor. An air conditioner with a rattling sound could have a problem with one of the unit's two fans; there's one in the front and one in the back. 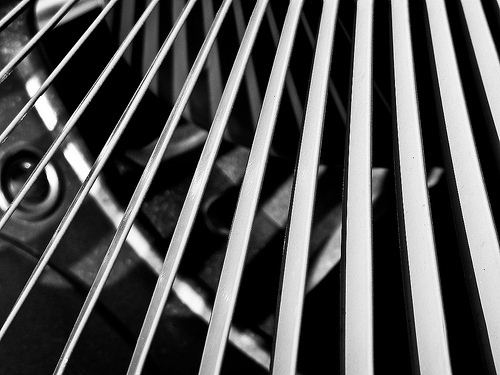 Fan blades can come loose or damaged and strike or rub against the fan housing. Fan blades (and blower wheels) are common replacement parts. But before you think too seriously about internal repairs, make sure the air conditioner rattling sound isn't coming from a plastic louver vent or other cover part on the front of the unit (you've probably already checked for that).